The Samsung Galaxy S4 Android smartphone is the center of attention at the moment with a release coming later this month across various regions of the world. Just after the phone was announced we gave you some first news of official accessories and now we have seen some first glimpses of Galaxy S4 official cases with some videos to show you. The Samsung Galaxy S4 is set to be the biggest smartphone release of the year so far and previously we gave you details of official cases, the Flip Cover, S View Cover and Protective Cover+. Until now though we had only seen one Samsung image showing the cases but today Rozetka, a Ukrainian website has come up with three videos that show each of these cases very nicely. 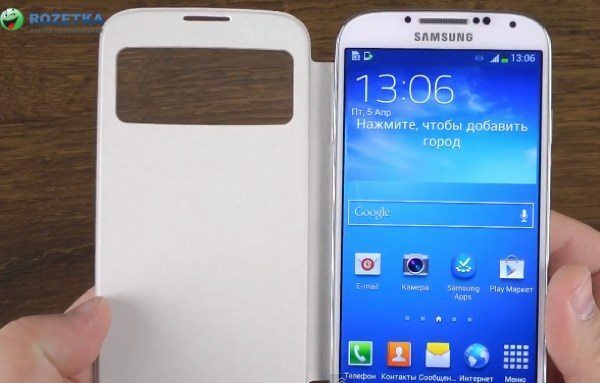 The first video shows the Galaxy S4 Flip Cover, which is similar to previous official cases for Samsung devices and offers screen protection with no cutout to the front. The second video is the Galaxy S4 S View Cover and this rather neatly unlocks the phone when the case is opened and also offers good screen protection. This one though, also enables the user to see the clock on the phone and notifications whilst still on via a cutout. The third video shows the Galaxy S4 Protective Cover+ made from hard plastic and offering protection to the back of the phone. This one is available in a variety of colors including black, blue, green, pink and white. We haven’t yet heard details of pricing or release but they are all likely to be available very soon as the handset itself starts to hit the shelves. You can view all three of the short videos below this story. Are you waiting for the Samsung Galaxy S4? If so, are you likely to protect your device with any of these official Samsung cases? Send your comments to let us know.